EPCT Corporation headquarters is based in Taiwan and is one of the leading manufacturersand exporters in all kinds passive telephone & communication accessories such as telephone accessories, ADSL filters, Category 5, Category 5 enhanced , Catetgory 6, Catetgory 6A, and 10G structure cabling accessories and fiber optics accessories. 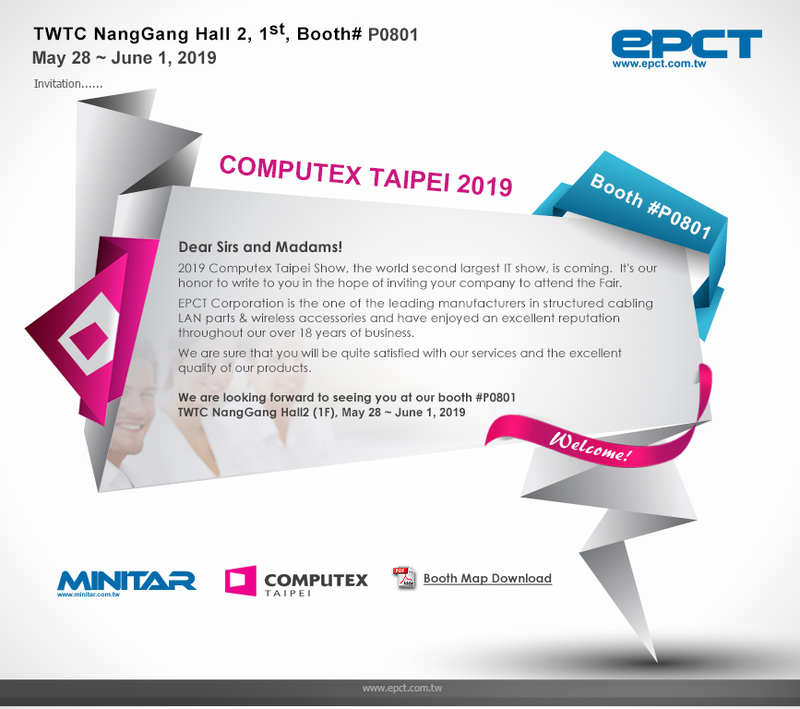 In 2001, EPCT Corporation started providing our customers with a total ONE STOP solution and began to develop active LAN gear and successfully entered the market. In early 2002, we announced 10/100Mbps LAN adaptor (NICs) and switches, and in the second quarter we announced the Giga NIC / switch, USB and IEEE1394 accessories. In Q4 of 2002, we announced our Category 6 structure cabling system and Wireless LAN products. With our express R&D team, we also carry the OEM production business of the ADSL, ADSL2, and ADSL2+ related products from our customers. Providing comprehensive highest quality, lowest cost with on time delivery and full, express way service in the telecommunication technology.